The City of Saint John is wrapped around the mouth of the Saint John River in southern New Brunswick. It is often called the air-conditioned city and is best known for its famous Reversing Falls. When the tide rushes in, its strength causes the mighty Saint John River to reverse its direction and flow upstream over the jagged rocks. The Falls Restaurant, open year round, has an excellent view of the falls – and great dining as well. 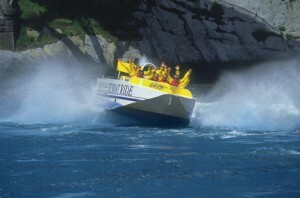 Reversing Falls Jet Boat Tours are available for those who want to experience the tide’s power first hand. The famous industrialist, K.C. Irving, conducted much of his business here. Today his family carries on with Irving commerce and industry. The Irving sign is very familiar to Maritimers. Saint John is the oldest incorporated city in Canada; many businesses have long been established here. Moosehead Breweries Ltd. and T.S. Simms Co. Ltd. have been in business for 135 years. Wasson’s Drugs was established at Saint John 100 years ago. Visit the Saint John City Market on Charlotte Street to find everything from produce to crafts, clothing, and gift items. Harbour Station opened in 1993. It is a large complex where sports, exhibitions, varied forms of entertainment, and civic events are held year round. Hockey is a favourite at Harbour Station, the QMHL Sea Dogs are most popular. The restored Imperial Theatre in uptown Saint John provides fine entertainment in luxurious surroundings. The acoustics are outstanding! The Jeux Canada Games Aquatic Centre attracts sports enthusiasts for swimming and diving teams; family swims are available. Kayak and scuba diving lessons are also available. 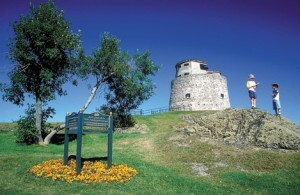 High on a hill in Saint John West stands the Carleton Martello Tower. It is a National Historic Site. Construction began in 1813 when Saint John was the Capital of New Brunswick. The tower is accessible through a second-story doorway. During WWII the tower housed communications equipment. An exhibit at the site explains its role during that war. Saint John is fortunate to contain several beautiful parks. The Irving Nature Park and Rockwood Park are two of the finest. Rockwood Park Interpretation Centre, an education centre for residents and tourists, is located at beautiful Rockwood Park. If you appreciate that ‘country in the city’ feeling, be sure to experience Saint John’s parks. Accommodations are readily available at Coastal Inn, The Delta Brunswick and the Hilton Saint John to name but a few. All have packages tailored to specific interests. Shamper’s Bluff Inn at Kingston provides unlimited use of canoes, kayaks, and bicycles. Because the city is so near the water, fog rolls in periodically and helps to air-condition the entire area. Ships anchored at Saint John Harbour add to the view while crossing the Harbour Bridge. At Gondola Point, on a branch of the arterial highway, there are ferries waiting to transport passengers in their vehicles to the breath-taking beauty of the Kingston Penisula – the ‘Rock’ as residents have christened it. Without crossing the Kennebecasis River, there spreads a sandy beach: the Gondola Point Beach. Here the shore is lined with stately trees. It is an ideal location for watching all manner of water craft sail the waters that are stretched long and wide. Boats anchor near the beach with great views for photo enthusiasts. 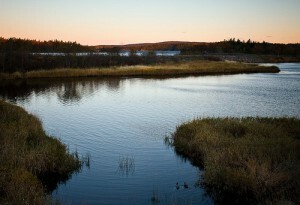 The Gondola Point Road clings to the fringes of the beautiful Kennebecasis River. On the far shore, a line of low, rocky mountain ranges are in view. On Rothesay Road, beautiful homes with fine architecture are set beyond sweeping driveways, stately trees, meticulously kept lawns, and intricate flower gardens. The Rothesay Common, a beautiful park, hosts live entertainment during summer evenings that ranges from Shakespearean plays to country hoedowns. At Renforth Rotary Park there is a three-story working lighthouse where, on rainy days, children are entertained by making crafts, painting and much more. Follow Model Farm Road to Meenan’s Cove Park where sheltered picnic tables are placed with a view of the Kennebecasis River and playground equipment entertains the little ones. Vehicle and trailer parking, a walking trail, and a ball field are also available. A tiny covered bridge completes the tranquil scene. The Kennebecasis Valley is dotted with beautiful private homes that are surrounded by nature’s beauty. At Renforth, on a cold February afternoon, atop the frozen Kennebecasis River, the sight of fishing shacks, little, square buildings that shelter fisher people caught some attention. Cars were also meandering across the frozen expanse. At Meenan’s Cove, shacks painted in pastel colours decorated the icy surface of the river. The shacks contain small wood stoves for warmth. A round hole drilled in the centre of the frozen ‘floor’ provides a space to dangle a fishing line from which many tiny smelt are reeled in, providing a fish feast later on. This sport is enjoyed every winter by rather hardy folk. At Gondola Point Recreation Centre the sight of children zooming down snow-covered hills atop their crazy carpets brought one of winter’s youthful pleasures to mind. In the white wonderland, their splashes of colour moved about quickly. They brightened the chilly day.